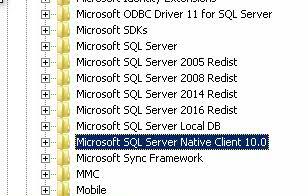 Few days ago, I had a task to check if SQL Native Client version 11 was installed on some server in our environment. Of course, I could have logged in to all of my servers and check manually, but why I should do that if I could achieve the same thing with PowerShell. And it would be faster and simpler. In order to install SQL Native Client 11 with PowerShell, I will check the registry for the installation. If it is not there, I will start msiexec.msi and install SQL Native Client 11 silently. This will give us the list of all registry keys which are located under HKLM:\Software\Microsoft location. As you may see, we have a list of keys which contain ‘Client’ in its name, but none of those are SQL Native Client 11. Now, we have to go thru this list and make sure that in case that there is no SQL Native Client 11 present, we could proceed with the installation. If there is SQL Native Client 11 installed, that is fine, we can finish because we have already installed. But in case we don’t have it installed, we could move forward and start the installation. I have downloaded SQL Native Client 11, and have placed it in C:\temp\SQLNativeClient11. We will use msiexec.msi tool for the installation of SQL Native Client 11. In the end, we will check if the SQL Native Client 11 is installed, by doing almost the exactly the same thing like at the beginning, checking the registry. So, that is it. It was really a small piece of code, but you could use this together with other installations, updates, and so on.